Mark Wenzel joined Bradley, Drendel & Jeanney in March 2005. He came to the firm after eight years of trial experience in a law firm where he worked primarily as defense counsel in bad faith cases and personal injury cases. He also brings special expertise to matters involving complex insurance coverage issues. His background and experience makes Mark a valuable resource to our clients, as he provides a unique perspective and understanding of the insurance industry and the manner in which they evaluate, investigate, and litigate personal injury claims. Mark now devotes his practice strictly to personal injury cases, including automobile and trucking cases, product liability, premises liability and insurance bad faith. 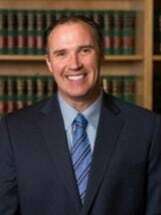 After graduating from Gonzaga Law School in 1995, Mark worked for two years as a law clerk in the Nevada Supreme Court prior to focusing his practice in civil law. He is a native of Chicago, Illinois, and received his undergraduate degree from DePaul University in 1990.